Enjoy small town living in this charming 3 bedroom 1st floor apartment located about a block from Lake Michigan. Within walking distance to restaurants, shops and the Garden Theater. This property is located in a pleasant, quiet neighborhood. This unit can be rented separately or together with the upstairs apartment to accommodate a larger group. Take delight in your morning cup of coffee on the porch, or take a short stroll to Main Street and get a light breakfast at the Crescent Bakery. Take a drive into the Leelanau Peninsula and tour wine country before stopping at the Sleeping Bear Dunes to take a sunset cruise. 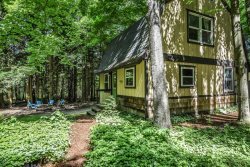 Beach Breeze Cottage is in the perfect location, central to everything Northern Michigan has to offer! Walk right off the patio and into the comfortable living room that invites you to relax. The second bedroom is located off the living room with a door to the first bedroom that has a second door exiting into the dining room. Both rooms are tastefully decorated! The dining room and kitchen are located at the back of the cottage. The bathroom is just off the kitchen with updates that give it a modern flair.